Having missed teeth is not only embarrassing but also affects your oral health if left untreated. Yes, replacing missing teeth is essential to your overall health and health of your teeth and gums as well. When your natural teeth are missing, you will lose the functionality, and it can lead to various dental issues. If you want to have your smile back, then replacing your missing teeth with dental implants is the ideal solution. The dental implants in Sydney can help regain your self-esteem, look and feel better, and more importantly, have a better quality of life. Compared to bridges and dentures, teeth implants provide lifelong benefits. Come on let’s explore the top five advantages of replacing a missing tooth with implant-supported replacement teeth. When you lose teeth, you will also lose bone mass in your jaw. The jawbone needs proper stimulation to maintain the bone density. Bridges and dentures will reduce the quality of jawbone. Whereas, dental implants are the only tooth replacement option that preserves the quality of jawbone and stimulates them naturally. As the implants are anchored into the jawbone, they naturally fuse with the jawbone through the process called osseointegration and form a sturdy foundation to hold the new replacement tooth. Thus, it helps prevent bone loss. 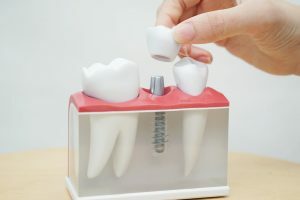 As they are inserted into the jawbone, dental implants act as the root for a new tooth, and they allow you to bite with more or less the same amount of force you could use with your natural teeth. In case of other tooth replacement options, they do not restore nearly as much of your bite force because they are placed on the top of the gums. Unlike dentures, dental implants in Sydney are easy to maintain. All you need to brush and floss your teeth twice in a day, as you do to your natural teeth. There is no need for adhesive or special flossers or any other special products to clean and care for them. As dental implants come in a wide range of shapes and sizes, the dentist will work with you to design implants that match the colour of your surrounding teeth and fit perfectly. In short, dental implants look, function, and feel like a natural tooth. Though they are artificial teeth, dental implants need to be cared for to prevent bacteria from building up in your mouth and causing infections. The material that teeth implants are made of can’t decay. With the advancements in dental technology, the dental implants cost is sure affordable. Speak with your dentist and find out the right option for you. If you are looking for tooth replacement options, consider dental implants.